The arrows point to three of the eight speakers stationed in this silent auction area. One of the most difficult venues to hold an auction is in a gym. Though the venue often offers adequate space, it is a difficult place to control audio. By design, gyms are noisy venues. No one wants to sit through a quiet basketball game, so gyms are designed to deflect the slightest utterance. The shape of the building and the hard surfaces reverberate the sound, bouncing it around the room to make the noise louder and less clear. This presents a problem for fundraising auctions. We don’t just want *loud* sound. We want *clear* sound. Without a proper sound system, auctioneers sound like adults in Peanuts cartoon strips. Remember how Charlie Brown’s teacher talked? “Mwah, wha, wha, wawwww.” There is no clarity nor distinction in that! You can hear it, but you can’t understand it. Guests must understand what they hear. If they cannot clearly understand, they tune out and often start talking (louder) to their neighbor. It isn’t long before their boisterous conversation is contributing to the overall noise level. At an auction this past weekend, the school used two gyms. One gym housed the silent auction. The other gym housed the live auction. Both gyms had good sound systems, especially when one considers the challenges of each room. In particular, the silent auction gym is a struggle to control, in part because non-seated, cocktail-strolling guests are louder and more distracted than seated guests eating a dinner. Even so, this is one of the best attempts at making the silent auction space good for promoting ticket sales, bidding, and other announcements. Check out the silent auction sound system layout in the video below, which was provided by All Stage & Sound in the D.C. area. It’s also worth noting that this was a mobile bidding silent auction. Even though guests are alerted with messages sent via their phones, we’ve found that a sound system is still the best way to draw attention to activities and certain items. Guests may or may not use their eyes to look at their phones, but they hear regardless of what they are doing. Want to learn more about silent auctions? 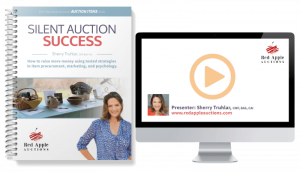 I’ve got a popular master class, Silent Auction Marketing Savvy, that covers everything you need to know about selling your silent auction items for strong returns. In the class, you’ll learn the tricks — the marketing, the psychology, and the science — behind a top-performing silent auction. A sound system is just the beginning! We explore bid sheets, set-ups, analyzing results to understand your audience better, and more. Check out the course on this page. Sherry: The Derby Community Foundation has incorporated many of your ideas over the past few years into our gala fundraising event, Uncorked, with good results (raising more money each year). This past February, we tried a Fund A Need auction for the first time–we called it Fund the Future because we didn’t have one particular need per se, we award grants to various non-profits in our community that serve a wide variety of needs. Anyway, for our first attempt at Fund A Need, we were very pleased with the results. We followed your suggestions for securing a couple of “heroes” who would start off the Fund A Need bids and, just like you said, once the ball was rolling others made bids as well. Additionally, I’ve received many comments from people who thought it was a brilliant idea and believe that it will only grow as folks catch on to it! I even received a couple of checks after the event from folks who didn’t bid at the event but wanted to make a contribution to our efforts. 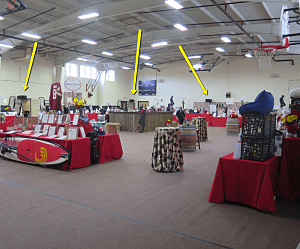 Your recent article about sound in a gym is also timely–the new event venue that we used this year for our Uncorked is a remodeled school gym. We did have some issues with sound, but are hopeful that next year we’ll have better luck with the new sound system that has been installed in the building. We always look forward to your emails which are full of great ideas. Stay tuned — I’m working on new projects/classes that would be of interest to you, too.